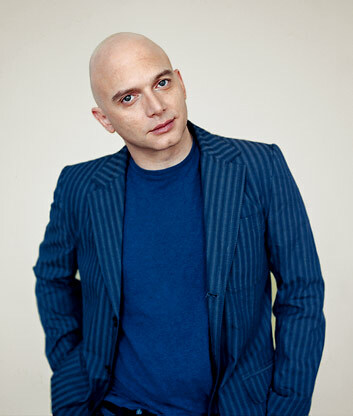 Michael Cerveris does Broadway plays (The Who’s Tommy), Bowery rock shows (as a solo artist and member of Bob Mould’s band) and things in between (Hedwig And The Angry Inch). Nominated for a Tony Award earlier this year for Sweeney Todd (he won one in 2004 for Assassins), the actor/musician will release The Hinterlands EPs next spring on the Low Heat label, with guest performances by members of Teenage Fanclub and Gorky’s Zygotic Mynci. Cerveris selected a playlist of songs by his friends and acquaintances. The New Day Rising cassette lived in my old 1969 Dodge Dart for about a year. From that point on, Hüskers and Replacements poured in my ears and through my blood. I’ve always admired how Bob Mould can pour his undiluted heart straight out through his voice and hands. Once, when I was touring as his guitar player, I started playing this song at soundcheck. He told me not to hurt myself. I took the hint. The sparkling harmonies, the chiming guitars, the combination of melancholy and joy, simplicity and chaos—it’s all stuff I aspire to in my songs. I met (singer/guitarist) Norman Blake in a NYC guitar shop a year or so after this was released, and we became fast friends. His support and generosity are at least half the reason I ever managed to record anything at all. This song is almost crushing in its honesty and directness. I met Ken through the Posies in ’93. He’s the most purely musical being I’ve ever known. When we were recording my first album, he wouldn’t stop until he’d created and put down a wildly inventive or subtly tasteful part on every track on the record. His solo stuff is as boundless as he is; even when it goes off the rails, it’s a glorious mess. Charles Thompson (a.k.a. Frank Black) gave me a solo acoustic demo that started with this song, and I put it on endless repeat for the rest of the afternoon. It’s not a story song, more a moment of realization. Kind of like those early black-and-white Jim Jarmusch movies: The sparse, cool surface gives you room to fill in your own meaning. The world—or at least radio—would be a much better place if the glut of young same-o bands under the emo flag had the equal parts Hüsker/Mats/Morrissey mixture that Idlewild has perfected. (Singer) Roddy Woomble is a friend and one of the true young poet lyricists writing these days. Any band that can get a rock crowd singing “Gertrude Stein says that’s enough” is doing something fairly subversive. When I started playing the role of Tommy, Pete said, “I can’t tell you how to act, but I can teach you how to be a rock star.” This summery little gem from Who Came First always makes me smile—especially the earnestness of the lyric “Cleveland, you blow my mind.” I think this song is why I named my dog Gibson. I love how this song seems to keep spiraling down without ever reaching the bottom. A space-rock version of a Shepard scale. I was a big Swervies fan and eventually worked with (drummer) Jez on some recordings in London. I think I got the idea that heavy can be beautiful from listening a lot to this song. I first met Vic when he came to see Hedwig. He and Jonathan Richman are friends and heroes that I can listen to anytime. Both are totally idiosyncratic and unique musicians who have almost playwright-like insights into people and their human frailties. Whether it’s Sweeney Todd or a gig at some dive bar, that’s the kind of magic I’m always looking for.